The Slingshot Crossbreed has evolved into a new shape. With its new features, dimensions and shape this board has become a true HIGHER PERFORMANCE ALL AROUND BOARD. This 33” wide board, with a volume of 230 liters is as stable and forgiving as they come. The pulled in semi displacement style nose and a fuller hard tucked rail is designed to deliver excellent touring performance and all around user friendliness. The Crossbreed also cuts through the chop, makes turns easily and handling knee to waist high surf due to the V spine bottom shape. The Crossbreed is the ultimate crossover of an all-around and performance touring board. Based on Slingshot’s Future Response Technology the Crossbreed is built with Wood Veneer Sandwich Construction (WVS). This proprietary construction controls the durability and flex of the board and the result is a proven lightweight, impact resistant board. 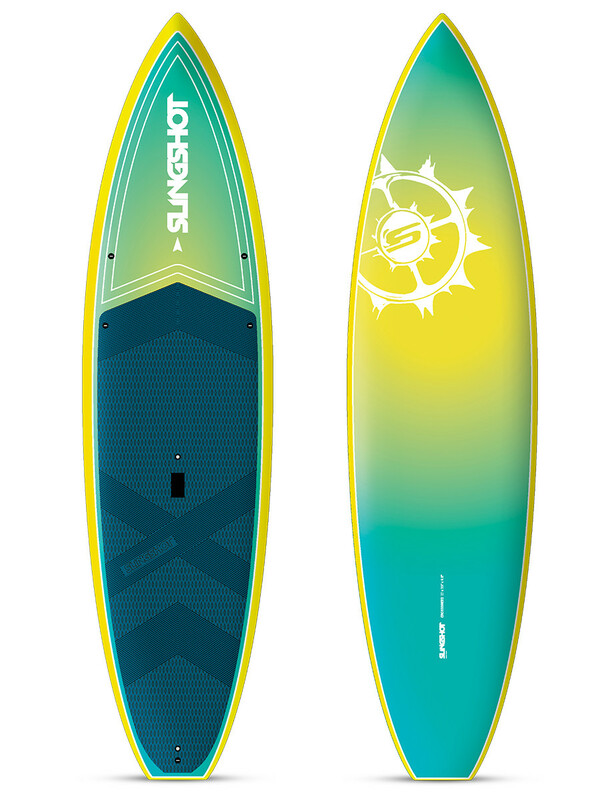 PADDLER PROFILE The Crossbreed is perfect for paddlers and athletes who want a board that that performs well across a variety of water conditions. Go fast on flatwater and have fun in medium size surf. The Crossbreed is the board they will never outgrow. Tighter turns and less friction on direction changes. Feet stay comfortable and pain free with plenty of room to adjust your stance as conditions change over the day. Designed with plenty of room to naturally fit the curve of your fingers, the flush mount carry handle makes it easy and comfortable to carry the board. Manually open and close vent plugs to allow your board to ‘breath’, equalizing internal and external pressure from heat and atmospheric pressure changes. Allows for securing personal items on the board.